There are times in life when we are compelled to take a “Leap of Faith.” Times when we must step out into the unknown with no possible idea what the outcome may be. Times when it has become just too painful to stay where you are. You may not know where or how to move, but deep in your gut you instinctively know that something must change. Oftentimes, we begin to examine our lives and the ever fearful voice of the rational mind says, “No, don’t do that you had better play it safe.” In those moments of decision we can either: let fear win and once again settle for less than what Spirit had intended for us; or we can listen to that still small voice, and take the leap of faith. Every moment of life is an opportunity to step back into safety, remain where we are out of anxiety and fear, or leap forward in faith. We will never know what we are truly capable of until we begin to release our doubts, disbeliefs, and fears in order to replace them with optimism, hope, and faith. Last month in Winds of Hope I quoted the famous biblical verse from Hebrews 11.1 “Now faith is the substance of things we yet hope for, and the evidence of the things we do not yet see.” I also defined hope as, “The belief that the things we desire are capable of becoming reality”. As such I posited that hope is an essential component of faith. If hope is the precious cargo that each of us holds deep within, faith the is the ship which will carry it safely through life’s storms. Faith is a convictional stance that embodies hope within a framework of trust. It offers the heart assurance that the hope one bears can be realized despite life’s apparent contradictions. Many would have us believe that faith lies in opposition to or contradicts reason, but in reality faith it transforms. This transformation is brought forth by bringing the objective (rational mind) and the subjective (inner heart) together in balance and focus. A healthy faith creates balance and focus by helping us to validate the self as an agent in achieving our hopes while simultaneously acknowledging that there is a greater source of truth that is available to aid and guide us. This transformation allows us to focus our thoughts and actions upon that which we hope for despite any lack of physical evidence to support our decisions because we trust that doing so is the only way that anything actually will change. Thus we see that faith requires that we take a vital and dynamic stance toward life. A stance which requires will, commitment, persistence, and trust that a source of wisdom far greater than self is ready and willing to provide us with assistance if we are prepared to accept it. This is one of the reasons why faith is always exercised in the present. Faith forces us to live and be present in the “now” because that is the only time it can be actively expressed. We choose to trust now, act now, plan now, commit now, persist now…and this choice to focus our thoughts and actions upon the thing which we hope for prepares us to eventually receive it. Just as an idea or inspiration is lost without execution, so too “faith without works is dead.” Being conscious and present is always about expansion. To shrink back or stay put is about contraction and fear. Ultimately, fear is not about the obstacle you face, it’s about the level of faith and trust you are willing to act upon in that particular moment. Being in the now requires expansion, and as we expand for the leap out into what appears to be unknown; god, the universe, source, spirit expands to meet us. Faith prepares us to face the unknown but without action we are unable to receive it. I knew that something more than a single figure painted upon the paper was needed to create any kind of relevant composition. But the leaping figure was so visually powerful that I didn’t want to overburden the rest of the composition with too many additional details. The problem was incorporating an image or symbol which resonated with my inspiration but did not compete with the central image for the viewer’s attention. I needed something that was consistent with my vision but subtle enough for me to maintain control of the leaping figure as the image’s primary focal point. The Japanese symbol Mitsudomoe provided exactly what was needed. The Mitsudomoe is found throughout Japan in many of the country’s Shinto temples. The three comma-like shapes within the circle are called “tomoe” and are reminiscent of the same tomoe found in the Chinese Yin-Yang symbol. In Shintoism the mitsudomoe represents the three realms of existence: humanity, earth, and sky. These three exist in a tripartite relationship of mutuality and interdependence. This conception correlates with my previous discussion of faith if we see humanity as the subjective aspect of the faith equation because our individual hope is always personal and subjective. Sky symbolizes the divine as the objective aspect of the being and its’ eagerness to work with us in the process of bringing our unique vision into materiality. The earth corresponds to the realm of action where humanity and sky come together in the project of materialization. A mature active faith requires all three and recognizes their interdependence. The three swirling tomoe imply movement and action while simultaneously embodying the three aspects of faith. 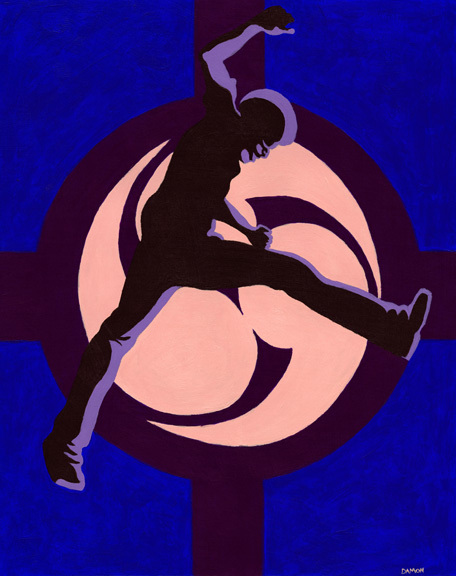 In “Leap of Faith”, the leaping figure represents a healthy humanity expanding itself in a forward leap. The figure is both purple and lavender. Purple is a color often associated with spirit or spiritual strength/power while lavender is reminiscent of the colors found in the higher chakras. The pink and blues in the composition are symbolic of both sky or heavens (blue) and the higher chakras or spiritual realms (pink). The brown represents the earthly realm where the demonstration of faith will ultimately be manifested. In this case, the leaping figure takes the action by leaping out into the unknown, but this is not possible without divine aid to guide, protect, and provide all that will be needed. Simultaneously, the results and context in which all of this activity takes place is the earthly realm. Both the leap and the evidence of divine support must both be played out within the context of earthly life. Thus, the three realms work in mutual interdependence. For me, this relationship is symbolized within the mitsudomoe.